Amida Buddha and his Vows offering universal salvation are the central features of popular Pure Land teaching. Amida is the Japanese reading for the name Amitabha or Amitayus in Sanskrit, as the Buddha of Infinite Light and Eternal Life. Emerging out of obscurity in ancient Mahayana Buddhism, Amida became the most widespread symbol of universal salvation for ordinary people in East Asian societies. From among the hundreds of texts devoted to Amida, three became central for the doctrinal and practical development of the tradition: the Larger Pure Land Sutra, the Smaller Amida Sutra and the Contemplation Sutra. These Sutras, as sacred texts, constitute the textual foundation for the independent Pure Land sects that developed in Japan. Most prominent are the Jodo-shu attributed to Honen (1133-1212) and the Jodo Shinshu, representing the teaching of Shinran (1173-1263). Shinran was a disciple of Honen. The Larger Pure Land Sutra is doctrinally important because it narrates the story of the Bodhisattva Dharmakara’s attainment, becoming Amida Buddha through the fulfillment of his forty-eight Vows. His Vows or deep wishes are aimed at establishing an ideal environment for achieving enlightenment termed the Pure Land or the Realm of Supreme Bliss which is said to be located in the Western region of the cosmos at an unthinkable distance. Those with sincere faith in Amida Buddha and undertaking prescribed practices would be born into this sphere in their next life, easily fulfilling the arduous practices leading to enlightenment or Buddhahood. There they would have spiritual support and the encouragement of the Buddha’s presence in maintaining the discipline. As a consequence of their spiritual progress in the Pure Land, the residents become bodhisattvas (one destined to become Buddha) and return to the world of suffering to help save all sentient (living) beings. Thus birth into the Pure Land was not a selfish goal but the ideal of joining with the Buddha to save all others. The Smaller Amida Sutra offers a highly detailed description of the Pure Land or Land of Extreme Bliss. In order to appreciate the description in the Sutra, we must imagine ourselves in that ancient time where people labored under great difficulty to wrest a living from the soil. It is a marvelous, wondrous land, contrasting to this world of limitation and suffering. The land is perfectly flat. People living in mountainous regions, would be greatly relieved, because there was no need to climb treacherous roads or engage in laborious cultivation of food. There are luxurious bathing pools, singing birds, cool winds, jeweled nets with tinkling bells that cover the trees which display gem-leaves of varied and brilliant colors. The text came to be used in funerals, expressing the hope that the departed now would be “in a better place” than what they experienced in this world. They meet their loved ones there. Everyone born there will become Buddha. Those who hear this Sutra preached and believe will themselves be born into the land. It is a Sutra of hope and consolation. It affirms the well-being of the departed loved ones who are in a place of peace, beyond the paths of transmigration and suffering. It also gives hope for our own demise. What may have begun as an object of meditation and visualization for ancient Buddhist monks, has become an object of faith and devotion. Trust in Amida Buddha and his saving work brings us to fulfillment in his land. It is no wonder that it has been so widely copied and used in temple services to this day. The meditations require singlemindedly focusing the mind, while contemplating the sun, water, the ground of the Pure Land, its trees, the adornments of the land, the Buddha’s many features, the Bodhisattvas Kannon and Seishi, who assist Amida and are manifestations of his compassion and wisdom, and finally visualizing oneself in the Pure Land. The mind, identifying with the object of meditation, becomes purified and enabled to enter the Pure Land. The final form of meditation made the text a central resource for popular Pure Land teaching beyond monastic institutions. The Sutra teaches that the lowest level of defiled or evil people could gain birth into the Land by reciting the name of Amida Buddha, Namu Amida Butsu, “I take refuge in Amida Budda” with the help of a good friend or teacher, even at the last moment of life. One recitation purifies of aeons of evil karma. This path is for those who are completely unable to avail themselves of the practice of visualization in the earlier twelve meditations. The final option opened the path of hope which is characteristic of Pure Land teaching. The Sutra concludes with the spiritual awakening of Queen Vaidehi and her attendants who all aspire to go to the Pure Land. There are several aspects of the Sutras which made them the basis for the popular spread of Pure Land Buddhism. The first is the story of the Bodhisattva Dharmakara (Storehouse of Truth) in the Larger Pure Land Sutra. 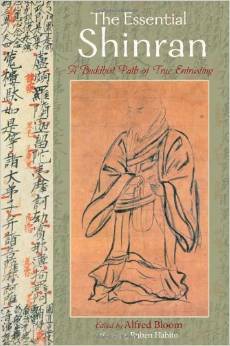 According to this text, the Bodhisattva was a king in a far off land in the cosmos. Seeing the suffering of the world, he renounced his throne and became a monk, seeking to find a way to bring all beings to enlightenment. Rather than a political kingdom, he made forty-eight Vows or wishes that he would create an ideal world to attain enlightenment through his unceasing Buddhist practice. His dedicated effort through five aeons of time resulted in the establishment of the Pure Land and his status as Amida Buddha. Several Vows became central for Pure Land teaching; the seventeenth proclaimed that the Bodhisattva’s achievement would resound through the universe. The eighteenth Vow promised that anyone thinking on him for ten thoughts would be born in the land. As the tradition took shape, the recitation of the name became the practice of the Vow and the easiest path for ordinary people. The twentieth Vow was also considered to support the recitation of the name. The nineteenth Vow offered the path of meditation and as a means of attainment. Also the Buddha would come to welcome the devotee to the Pure Land on his/her death. The Vows are based on the principle of interdependence as the Bodhisattva pledged that he would not accept enlightenment himself unless all others gained it with him. The power of these Vows express the earnest desire in all beings to fulfill themselves through growth and creativity. The power or force of nature which we see in the growth of plants and animals, even under great odds and difficult conditions, witnesses to the Vows at work in our reality. The Vows are a focus for the aspiration of all beings to a higher life of value and meaning. The land is symbolic of the importance of environment for spiritual development. Growth, spiritually and intellectually or culturally, does not take place in a vacuum. People rarely rise higher than their environment. Criminal or addicts who return to the same environment they left frequently repeat the same crimes that defeated them previously. When the conditions are present in terms of social, or family support, students are able to progress more easily. While the individual’s ability and effort are important as cause, the environment, as condition, enables the student’s success. The symbolism of the Pure Land shows ancient insight into the importance of environment for one’s development. Finally, the Buddha who resided in this land became the object of worship for the Pure Land tradition. According to the Sutra story, his buddhahood resulted from his infinite good karma which he acquired by his practice and turned over to all beings. He invested his spiritual power in his name for their benefit and as the means to enter his land. Amida was initially one Buddha among many of the Buddhas in every quarter of the universe. As his devotion to him expanded in later history, he became the chief Buddha among the many buddhas in Mahayana Buddhism. This is represented in the teaching of Honen. However, with Shinran, the founder of the Jodo Shinshu tradition Amida Buddha became the supreme Buddha as Reality itself. All other Buddhas were manifestations of Amida who is the direct expression of Reality which we can never conceive apart from form. That is, when we speak of Reality, it is always in personal terms. Anthropomorphism is a universal trait of religion. We cannot conceive of a Reality higher than ourselves. This reality speaks, wills or acts for the benefit of humanity. As Reality, Amida is the buddha-nature in everything. This means that everything has the potential to support and realize spiritual life. All our relationships, even negative ones, can enhance or expand our religious vision and understanding. This view encourages a positive view of all life and challenges us to see the spiritual dimension and truth in all experiences and situations. It offers a holistic and integrative approach to life. Thus Amida, whose name means Infinite, raises our spiritual horizons beyond our limited and narrow confines to recognize that we are all more than we may appear to be. Amida is not a transcendent God above and beyond all creation. Amida is our within and without; the truth within all truth; the ideal in all ideals; the relation in all relations; the meaning within meaning. Spiritual liberation is complete, here and herafter. Such is the essence of the Pure Land path.